At 7PM on the 15th of August at Huecke’s Hall of the Promenade Hotel Liepaja the audience of the Music Festival Liepaja Summer will have the opportunity to enjoy a concert of the favourite Liepaja Symphony Amber Sound Orchestra (LSO) brass ensemble Amber Sound Brass, this time performing in a quintet setup. 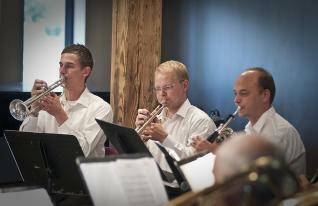 Amber Sound Brass quintet will perform jazz music, ragtime music and arrangements of film scores (G. Miller, H. Arlen, P. Desmond, T. Merle, E. Morricone, H. Manzini, M. Penella, and other composers). This time the ensemble setup will be somewhat unconventional – instead of tuba the audience will be able to appreciate the sound of a bass trombone performed by the great trombonist Māris Zondaks from the LSO. 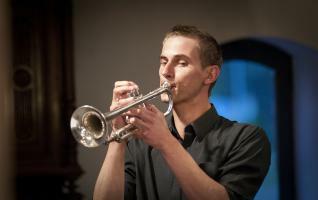 Other members of the quintet are Janis Ivuskans and Viktors Hrustaļovs (trumpet), Marcis Auzins (French horn) and Arturs Hrustalovs (trombone). For the Music Festival Liepaja Summer concert programme we have selected the best opuses ever written for brass quintet. It should be noted that the available repertoire for this setup is rather limited, so we chose to perform what we thought sounded best and would appeal to our listeners. Maris Zondaks was once offered a permanent place at the famous Marinsky Theatre Symphony Orchestra, Arturs Hrustalovs won the last year’s Andrejs Jurjans International Wind Instrument Performance Competition. I should add that the audiences of Liepaja have enjoyed the performances of the Amber Sound Brass ensemble for a long time. I am very glad that the beautiful sound of our collective has been enriched even further thanks to the generous donation of instruments from the Liepāja City Council. As always, the charismatic presenter Dzintars Jurgelaitis will play an integral part in the Music Festival Liepaja Summer chamber music concerts, introducing the repertoire and the performers. The Music Festival Liepaja Summer will take place till the August 30. Tickets to the Music Festival Liepaja Summer concerts are available at the ticket offices of Bilesu Paradize. The Music Festival Liepaja Summer is co-financed by the Liepaja Culture Department, the State Culture Capital Foundation and the Embassy of Israel. Previous Previous post: Stem Cell Banks Operate in Safe Way. Next Next post: Sculptures… Hilariously Dressed.